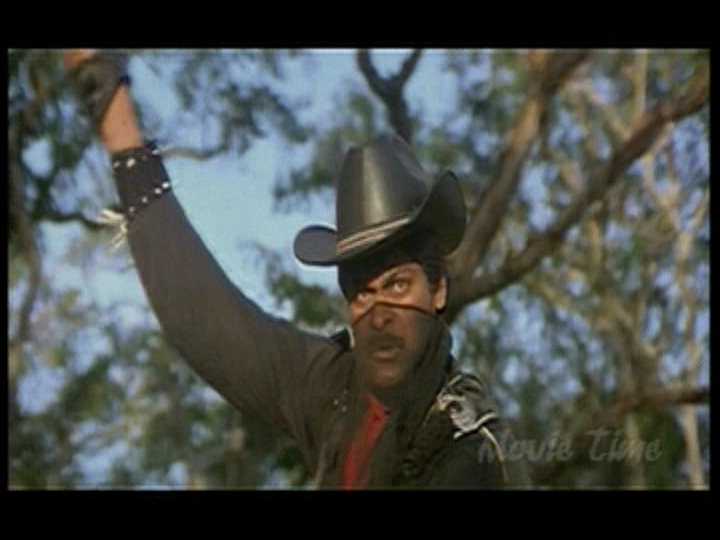 This entry was posted in Tollywood and tagged A. Kodandarami Reddy, Allu Ramalingaiah, Amrish Puri, Chiranjeevi, Chiru, Happy Birthday Chiranjeevi, Illayaraja, Kondaveeti Donga, Megabirthday 2012, Mohan Babu, Nagendra Babu, Radha, Rao Gopal Rao, Sharada, Telugu, Vijayasanthi, Vijayashanti, Yandamoori Veerendranath. Bookmark the permalink. Can I just ask where you purchased this DVD with english subtitles? I have been looking for it. I looked on Ebay but it wasn’t listed there (?) but when I contacted Boombox India they kindly listed it maybe it was sold out–I already bought my copy and I would say anyone who likes the look of this to buy one also! Hoorey! you like this movie. I watched it long time ago and loved it! 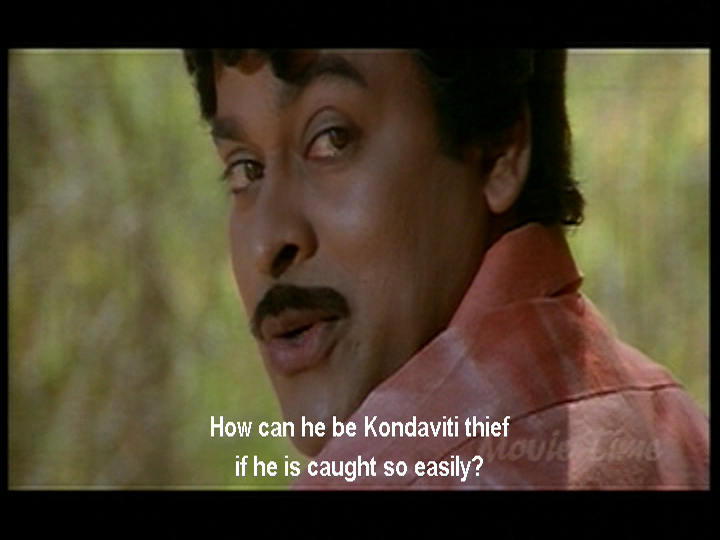 This is the best side of Chiru for me. Add ilaiyaraja to the list 🙂 🙂 . BTW,when i watched this movie as a kid i could not stand amrish puri-he was extremely scary(also JVAS).the movie is a true masala film. 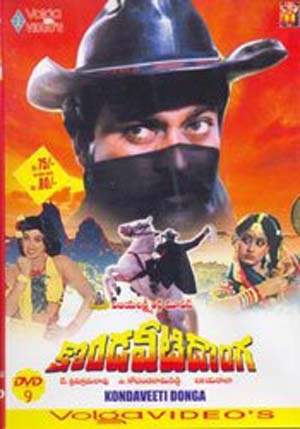 Subhalekha song that you embedded was one of the super hit song at that time. it used to play almost every sunday between 11 to 12 am every sunday in govt radio stations(there were no FM stations at that time in india).They used to play hit songs during this time. 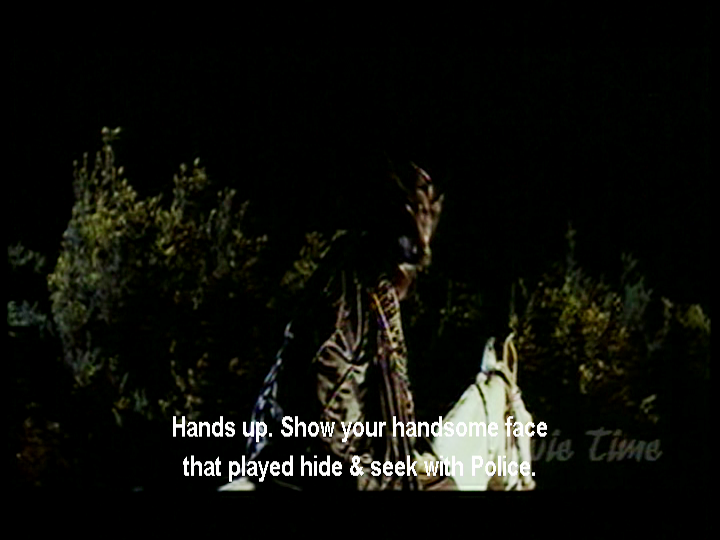 In the ecent Gabbar singh movie Ali characters at its entrance also sings this song . 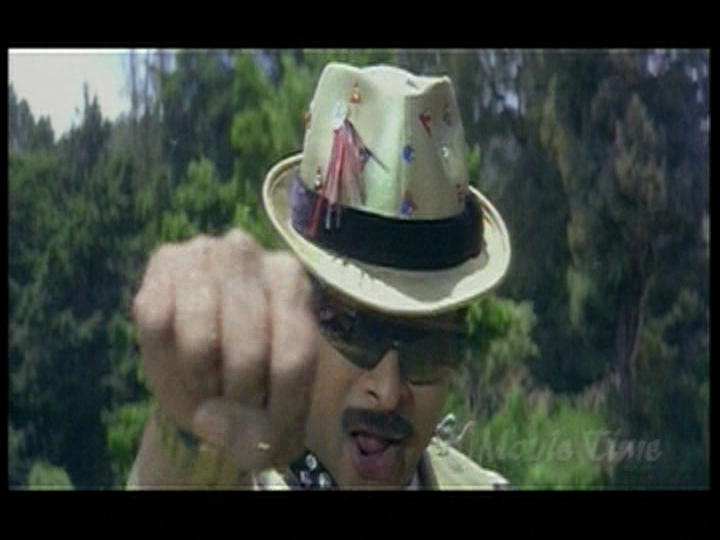 Now this song is being remixed in one of the Charan’s forthcoming Nayak movie between him and Amala paul. 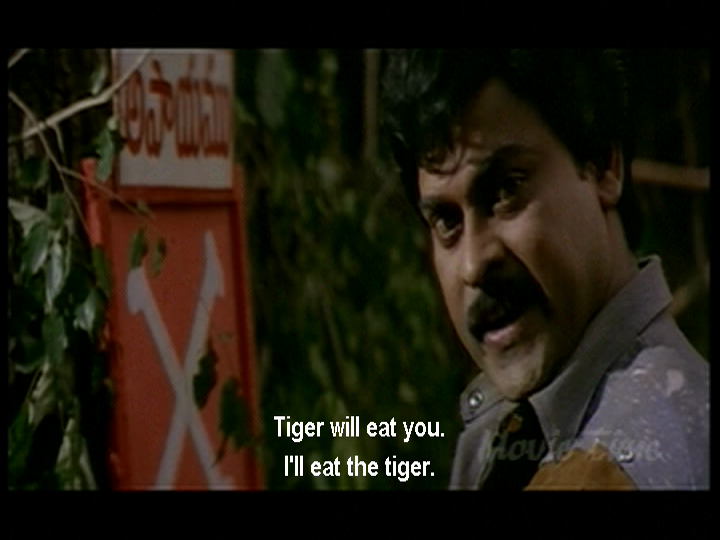 Growing up in 90’s in a Telugu household, I wasn’t a huge fan of commercial, action movies, but I love this one. 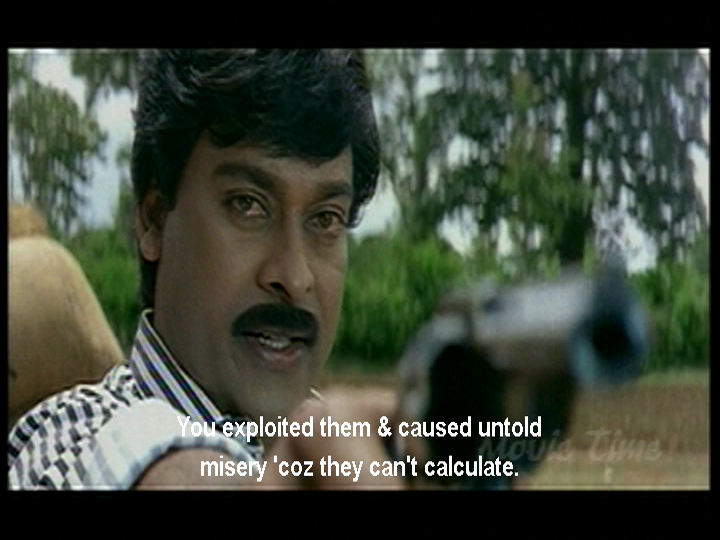 This is exactly how a masala movie should be made! Sensible hero, strong heroines, excellent supporting characters and cast, lovely music (I’m partial to the ones featuring Vijayashanti over Radha) and entertaining story. Though the movie would have worked perfectly even with out the flashback rivalry, Sarada’s powerful presence elevates it to a different level. 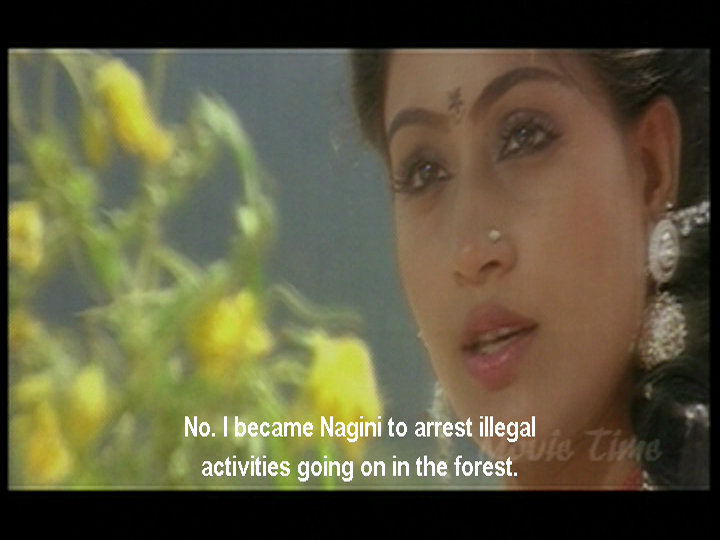 My only complaint it with the casting of Radha. She’s just so plain. Not a major issue in what is supposed to be a commercial film, but a better actress would have given more depth to her interactions with her crush and her sister. She is the only one who figures out his identity and he instantly trusts her with his secret. Both girls like the same guy, only one of them knows his secret and the guy happens to fall for the other girl. There’s so much drama right there.